Explanation: A historic first Space Quidditch match came to a spectacular conclusion last night as astronaut Michael Lopez-Alegria caught the Golden Snitch to give the Americans a hard fought victory over the Russians. "The Russians used brilliant strategy, but only NASA had the T2KQMU (Thunderbolt 2000 Quidditch Maneuvering Unit)," commented Lopez-Alegria, pictured above squeezing the elusive Golden Snitch in his left hand. Happy April Fools Day from the folks at APOD. 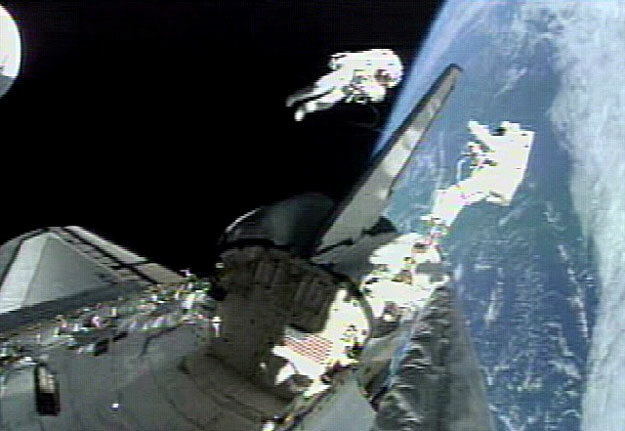 In reality, Astronauts Jeff Wisoff and Lopez-Alegria are shown space-walking last October during a space shuttle mission to help build the International Space Station.